In case you missed Brandon Vogel’s column following the Huskers’ 43-36 win over Arkansas State Saturday night, head coach Mike Riley essentially said the exact same thing Monday morning when asked about the Huskers' defensive showing in their season opener. “[Arkansas State] had yardage, and we anticipated a lot of what they were going to try to do and they did it well,” Riley said. Arkansas State racked up 497 yards of total offense Saturday, including 68 pass attempts for 415 yards. As Riley pointed out though, the Red Wolves only had five truly explosive plays. The longest run was a 14-yarder, and the longest pass (29 yards) came by way of a busted coverage. Most of the damage was done through the air, but Riley and the coaching staff expected that from the spread offense. And for the most part, the Huskers defense didn’t surrender points easily. There were just mental mistakes that Riley says they need to avoid in the future. There was the kickoff return for a touchdown in the first quarter and the safety in the second quarter. “We don’t need to just give them nine points,” Riley said. Riley wasn’t pleased with the punt return, but he saw it coming. He said anytime there’s a muffed punt, the coverage team collapses, instead of staying in its lanes, and guys get the chance to break free. That’s exactly what happened on Blaise Taylor's 63-yard return. He wasn’t happy about the late hit out of bounds on the ensuing punt after the safety, and he wasn’t happy about the personal foul on safety Antonio Reed on the Red Wolves’ final possession of the game. >> Senior wideout De’Mornay Pierson-El will not practice Monday while dealing with a shoulder injury. Pierson-El had two catches for 20 yards and a touchdown in Saturday’s game, as well as two runs for another 23 yards. Linebacker Marcus Newby will also sit out Monday with a hamstring injury, but it, also, doesn’t appear serious. “We hope he can do some stuff tomorrow,” Riley said. >> Sophomore tailback Tre Bryant got almost every carry Saturday, 31 of 38 in total, and Riley said that was a difficult decision to make. RB Tre Bryant on one of this 31 carries from Saturday's win over Arkansas State. Bryant, however, will get a few days off this week to rest a swollen knee. Riley said it’s nothing serious, and an issue that Bryant has been dealing with off and on while with the Huskers. >> Defensive coordinator Bob Diaco ducking the media after Saturday’s game was more miscommunication than anything else, Riley said Monday. Riley said that conversation happened a few weeks before the season opener, but Riley forgot to revisit with Diaco and finalize anything. The two were simply on different pages when the game ended and Diaco left. “That was what I think was a pretty innocent thing that turned into a bigger thing,” Riley said. Diaco is expected to meet with the media after practice Monday evening as well as after games moving forward. 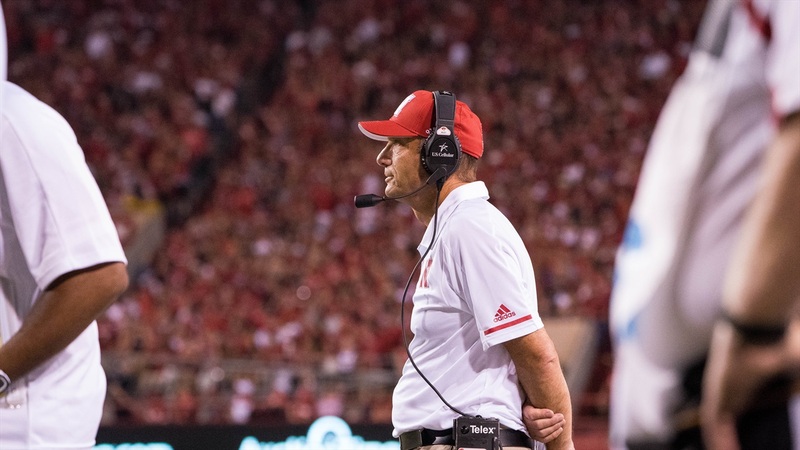 >> The Huskers have been working against a 3-4 defense all of fall camp, and after facing a 4-3 front from Arkansas State, will be back to a 3-4 look from the Oregon Ducks this upcoming Saturday. Riley is hoping Nebraska’s familiarity will help in preparation. The 3-4 front Oregon ran last year should feel more familiar to the Huskers this time around. Riley also knows his team will need to be better when facing Oregon. Partially because the Ducks “got off to a great start” with a 77-21 win in their season opener, but also because Riley remembers just how loud it can get in Autzen Stadium in Eugene, Oregon. Riley said they’ve been working to simulate the noise the Huskers will face on Saturday as well as working on silent cadences to try and prepare.